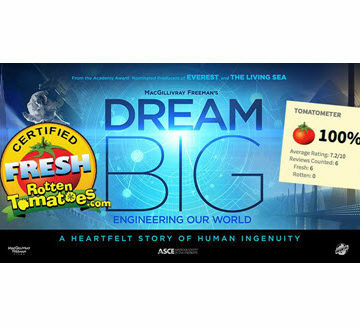 Dream Big is already scoring well on the Tomato-Meter. The Rotten Tomatoes website collects film reviews and separates them into positive (fresh) and negative (rotten). 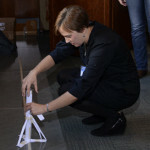 Dream Big: Engineering Our World checks in this week at 100-percent fresh. “Bolstered by sturdy computerized sequences and a rousing pop-song-populated score…, it’s the sort of majestic educational film that every adult will want their child to see — and, in all likelihood, will want to see themselves,” wrote Nick Schager in Variety. For the sake of comparison, La La Land scores a 93-percent on the Tomato-Meter. Fifty Shades Darker? A 9-percent. 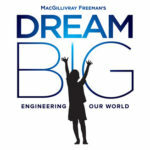 Dream Big, presented by Bechtel and produced by MacGillivray Freeman Films in partnership with ASCE, is playing on IMAX and other giant screens around North America.